These are the same cloth-backed vinyl work gloves used by commercial fishermen for the toughest, nastiest jobs. They feature a doubledipped, seamless PVC non-slip surface from the wrist to the fingertips and a high-top cuff that extends up your arm to keep your sleeves dry while providing excellent grip. Remains flexible in cold temperatures and is completely waterproof, impervious to most chemicals, and roomy enough to fit a light pair of cotton gloves inside for extra warmth. 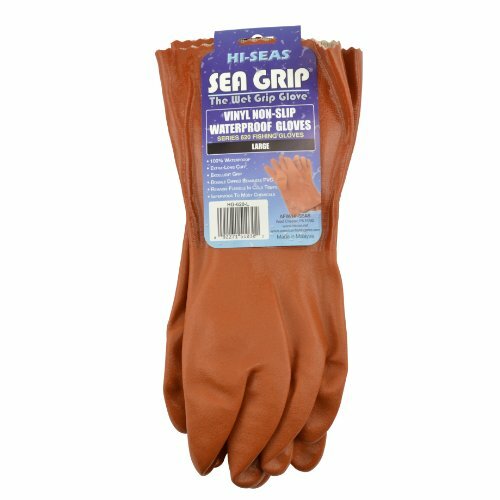 The next time you get stuck having to cut bait, these are the gloves to wear.